After his recent move to California to work as USA Manager, we caught up with Aqua-4D co-founder Walter K. Thut for an in-depth conversation about past, present, and future. Q: So Walter, you co-founded Planet Horizons Technology in 2004. How did you first meet Eric Valette (current CEO) and how was Aqua-4D® born? A: While working as assistant professor at the University in Chambery, France, Eric found my first website on the first generation of systems. A while later we met again and found out we had the same vision in terms of technology and environment. Eric’s conclusion, based on his university background in environmental engineering, was that exactly such technology was highly interesting for the future. So, we decided to team up for further development. Some months down the road we founded the company together with Nicolas Masserey as junior partner. Q: How did your past experience contribute to what became known as Aqua-4D®? A: I grew up in an entrepreneurial, free-thinking environment, working already as a child in the family’s construction company, and I became a civil engineer. In the 70s, the Swiss were one of the first countries to control waste water quality, so as a young engineer I was involved in designing water and waste water facilities, capturing sources, controlling river flows. I specialized in concrete, and concrete is a mix of gravel, sand, specific minerals, various crystallization processes, all like soil and fertilizers in agriculture. Later I worked also in the major company Sandoz (today Novartis) as Product Manager of their high-tech concrete additives. At the start of the 90s I was responsible for worldwide sales and marketing with a company specialized in material for making underground buildings waterproof, so I knew what it meant building up a worldwide presence. I’ve been working with EM water treatment since 1995, having first mainly developed and delivered systems for the concrete industry, and then the first growers in the Valais region of Switzerland. Q: In your free time you are an accomplished musician. Did your interest in music contribute to the innovation behind Aqua-4D®? A: Thank you for the compliment! Beside performing, composing and producing music, my musical background includes perspectives on physical and theoretical mathematics. Music may also help me imagine complex 4-dimensional processes (space + time), and the idea of the Harmonic Elements Table is surely based on this background. Q: Could you explain how you see the relation between music and science? A: Music is at once more than a science and wholly mathematical and scientific, such as with harmonic ratios, resonance phenomena, and 4D geometry. Meanwhile, music can explain the beauty of the formulas of Einstein or Max Planck. Q: If you’re talking about the function of the Aqua-4D® system to a non-scientist, how do you explain it? A: Aqua-4D helps the plant or other biologic structure to grow healthy and strong by continuously applying a very specific combination of vibrating electromagnetic fields to water in an irrigation system. Aqua-4D’s technology keeps the water at a specific molecular vibration. This influences biologic processes, including increased yields in agriculture – the water is absorbed into the finer pores of the soil, the roots then develop towards them, and the finer distributed minerals can be more easily assimilated by the plants. You can compare water to an orchestra playing in the middle of a city; it sounds nice, then some nearby construction site starts making a noise, then the traffic, and suddenly the orchestra doesn’t hear anymore what it’s playing. Then the director SHOWS the right rhythm, and the installed tuners will ALLOW CORRECT TUNING. Aqua-4D is the rhythm and the tuning reference for the water and connected biological and crystallization processes. Q: You’ve recently moved to California to take up the role of USA Manager. What has the response been so far, of the people to whom you’ve introduced this innovative Swiss technology? The response is overwhelmingly positive, the time is ideal for Aqua-4D. The contacts and meetings I’ve had so far showed a highly interested agriculture industry here in California, and other states. The situation here is that intelligent water management is in urgent need – there are heavy economic and an ecologic issue at stake, and the future legal situation enforces water saving and production optimization. Q: So what do you think are the benefits Aqua-4D® can give growers and producers in this region? A: Aqua-4D is a game changer, let’s make this clear. It has the potential to strengthen the economic position of the customer, and the key is fast ROI. The main income of the grower is their crop; if we increase it, reduce operational costs, plus give them earlier harvests, these are strong arguments. The growers also like the benefits of healthier food, water savings, and that it’s environmentally-friendly. Creating a sustainable water management they like, they sometimes don’t believe the effects before having seen with their own eyes. By cultivating huge surfaces of initially desert land, agriculture can contribute strongly to CO2 reduction, regional climate cooling (through evapo-transpiration of plants), and the Central Valley here can produce healthy food for two of the biggest US agglomerations nearby. For succeeding and overcoming the negative aspects of agriculture, the key is the now beginning fusion of a traditionally conservative agriculture industry with the high-tech industry, including automated monitoring and modern organic fertilizers. We are part of the next step of this fusion, by applying Aqua-4D technology’s high-quality modular system, based on decades of R&D and field experience. 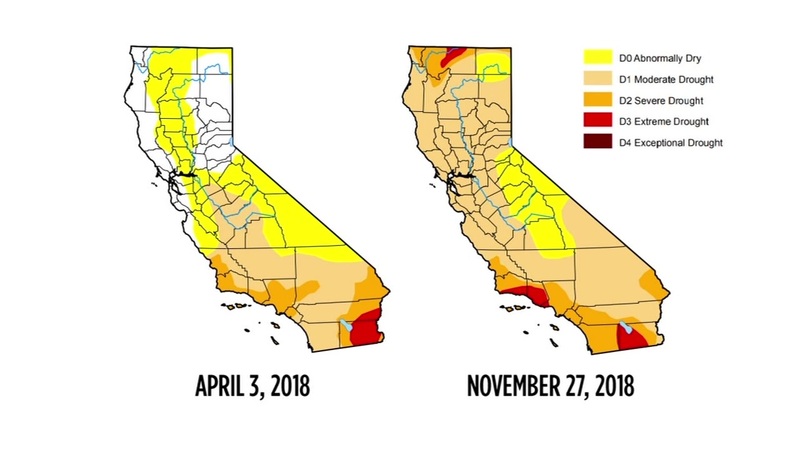 Q: Despite some recent rainfall, a significant part of California is still classed as being in between moderate and extreme drought. With often water-intensive products such as almonds, pistachios, avocados, and grapes, how could the Aqua-4D® system help Californian growers save water? A: Let’s firstly look at almonds. They require lots of water, and already optimizing the irrigation rhythm can reduce water needs by a factor of 2. So instead of proposing a client an Aqua-4D system for 300,000, with ROI of 2 years, I propose him investing in irrigation automation for 20,000 and Aqua-4D for 150,000, with ROI in 1 year. The effect will be for sure that he will order for the next 5 pumps a year later, a matter of budgeting. And in such a case, of merging different technologies, water consumption can be reduced by around 60 %! Now to answer your actual question: The potential of Aqua-4D on water savings is different case by case. Soil, climate, original water quality, irrigation management and plant adsorption play a role too. Today’s potential here in water optimization is way over 50 %, by upgrading to technologies including Aqua-4D. Aqua-4D mainly saves water with the increased water retention capacity of the soil, due to a higher affinity of the treated water to the present minerals. This higher affinity creates increased capillary effects, and the finer pores will also be filled. Q: Drought is often accompanied by soil salinity – how can the system also help with this all-too-common problem? A: Definitely. Our Technical Support team has lots of experience in this field, and for this issue they can demonstrate very interesting results in any part of the world. For example, one of the biggest fruit growers in Brazil were able to hugely decrease their soil salinity and keep growing on the same land, due to Aqua-4D’s leaching effect (more info here). Q: The company has an increasing number of demonstrations in the field underway in the States. Can you give us an indication of some of the results growers have found so far? A: Yes, well by March 2019 we will have at least 15 demonstrations running hand-in-hand with growers to prove the efficacy of the system. So far we can clearly see positive effects on the following problems: salinity, soil humidity (water reduction), yields volume, yields precocity, nematode effects, limescale. With the next series of demonstrations, we want to improve monitoring, and put the focus on ROI. We also partner up with companies doing monitoring of fields and agronomical consulting, which creates a win-win-win situation. Q: Finally Walter, what are your hopes for the coming months and into 2019? Pic: Meeting with growers at recent event in Utah (pictured with Aqua-4D agronomist Enrique Rebaza).